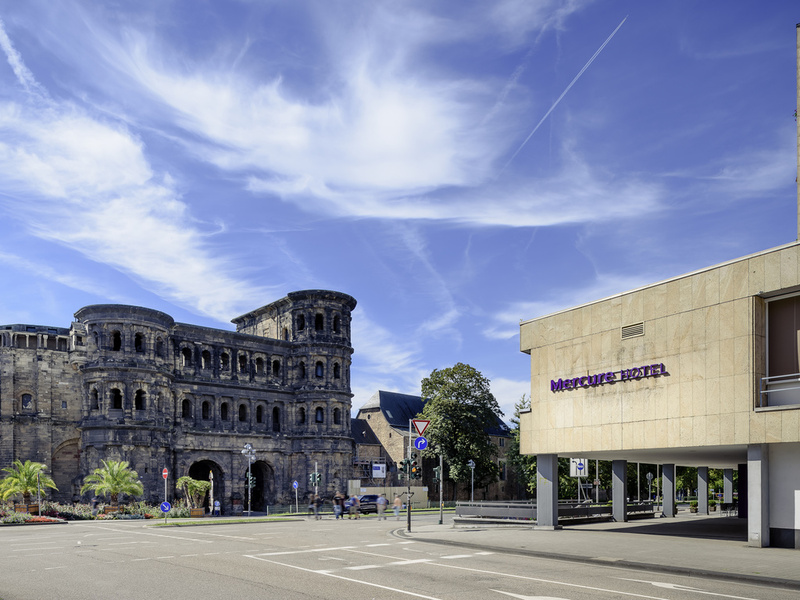 Enjoy the view of Trier's most well-known landmark: The 4-star Mercure Hotel Trier Porta Nigra has 106 air-conditioned rooms with free WIFI. Our hotel is CCH-certified and offers an events area with five meeting rooms for your meetings or functions for up to 200 people. Arrival: The main train station is 547 yards (500 m) away and Luxembourg Airport 24.9 miles (40 km) away. If traveling by car, take the A602 and use the public garage at the hotel. The city on the Moselle now known as Trier was founded by the Romans in 16 BC as Augusta Treverorum. Trier takes pride in its nine astonishingly well-preserved Roman and medieval cultural monuments, which have made the city a UNESCO World Heritage site. At the 4-star Mercure Hotel Trier Porta Nigra, you have the choice of Standard Rooms with single or double bed and Superior and Privilege rooms equipped with double beds. The Superior and Privilege rooms overlook the Porta Nigra, as do our hotel's two Maisonette Suites. All 106 rooms are air-conditioned and have WIFI access. One child aged up to 12 may stay in their parents' room free of charge. The "Porta" restaurant offers a varied regional and international menu. Our team caters for up to 120 guests, producing delicious dishes in pleasant surroundings between 6pm and 10pm. Come and enjoy a glass of wine after work or your favorite cocktail in our "Vis à Vis" bar with WIFI access. We can cater for all your needs and serve a selection of regional and international dishes between 11.30am and 10pm.